senior signing Archives - Custom sports posters, personalized team collages, senior banners, and team schedules for your athlete! senior signing Archives - Custom sports posters, personalized team collages, senior banners, and team schedules for your athlete! Congratulations to Jenna Ergle for getting the chance to continue her softball career at Boston College! We are glad that we could play a little part of making her big day special by creating her a custom senior banner! We were more than happy to create her signing day banner for her when we were given the opportunity. We are proud of her accomplishments Jenna has made of the years of being a softball player for Sumiton Christian School and Birmingham Thunderbolts. Good luck with your senior season at Sumiton Christian School and the upcoming years you will have at Boston College. Want to recognize your senior in a special way on their signing day? 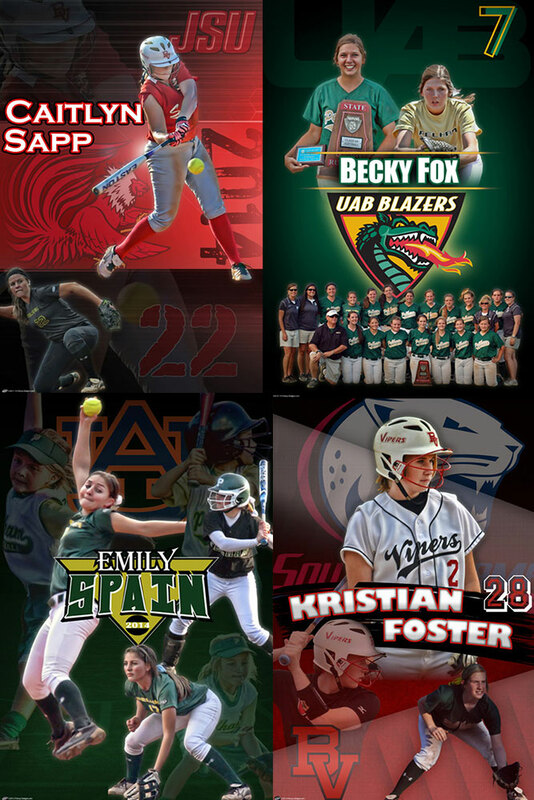 We were honored to be chosen to create custom softball banners to help four very talented ladies from Pelham High School in Pelham, AL to help celebrate their special occasion. Each design featured multiple action shots of the player from their school teams and their travel teams along with the school to which they were committing. Thanks Frenzy for the awesome design! You were great to work with and the finished product was loved by all! Hey, just got the banner and it is exactly how I imagined!! You guys are AWESOME!! Once again, exactly what I wanted!! Please know that I appreciate your hard work and kindness through this process. I am sure that I will talk to you soon about another project – since I am officially addicted!! You did an absolutley wonderful job! Everybody and I mean Everybody loved the Poster. Thanks again for doing this! It was exactly what I was trying to do and invision and you were right on the mark! Wow!!!!! You are good!!! It looks really good! I’m excited about it!!!!! The product was great and what I expected, but I have to say that the customer service was absolutely outstanding. You guys turned it around quickly and were always so quick to respond to my questions, and I was doing so much of it on the fly in between my meetings so I appreciate that so much! We had the privilege of creating custom senior banners for many schools to help celebrate their wonderful seniors and all of their had work they have put into their schools’ programs. Custom senior banners are a great way to answer all these questions with one simple solution. Let us help you create something unique that all the players, parents, coaches, faculty, and student body will love! Copyright ©2004-2019 Frenzy-Designs.com, Frenzy Designs, Frenzy Sports Designs. All Rights Reserved.